Dry Tortugas is a series of small keys filled with history, impressive architecture, an immense amount of wildlife, and unforgettable experiences. Quite possibly the most unique national park in the country, no other park provides such a feeling of utter isolation, especially if you're adventurous enough to stay the night out here. Get ready for an adventure like no other! Fort Jefferson courtyard and the large Rodman cannon. Photo by Daniel Sherman. Named by Ponce De Leon and his crew of explorers for its lack of fresh water sources and the hundreds of sea turtles originally found here, Dry Tortugas is composed of several keys. Only four of these keys are open to the public most of the year. Garden Key, on which Fort Jefferson lies, is the park's central access point and park headquarters. Garden Key is attached to Bush Key and Long Key, which are closed seasonally for bird nesting. Loggerhead Key is the only other key with permanent structures, which include a lighthouse and keeper's house. It lies 3 miles west of Garden Key and, while it is open to the public, is only accessible by private vessel. Construction on the impressive Fort Jefferson began in 1846 as part of America's Atlantic coastal defense system because the country did not have a fully developed Navy at the time. The fort was never actually completed or fully armed, but its massive size and composition of over 16 million bricks can still impress any visitor. Its location was primarily selected to defend a major shipping route that took advantage of the Gulf Stream current. It was designed to hold up to 420 large cannons, and several still remain, though none were ever fired. The Union was actually able to secure the fort and maintain its occupation for the duration of the Civil War. It functioned as a perfectly isolated prison to over 2,500 prisoners, the most famous of which was Dr. Samuel Mudd, who was convicted of conspiring with John Wilkes Booth following the assassination of President Lincoln. Though extremely small in size, there is no shortage of activities in this unique place. Probably the most popular activity is snorkeling. A mask and fins are provided by the ferry boat and included in your fare. This area lies at the south end of the Florida Reef Tract - which is the third largest corral barrier reef system in the world. And the shallow, clear waters surrounding Garden Key are ideal for viewing sea life and colorful reefs that have developed on the submerged old pilings and along the moat walk. 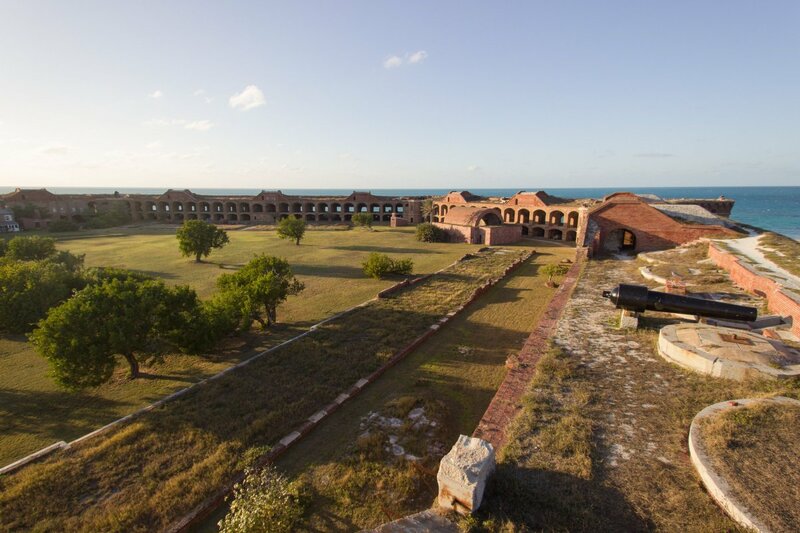 Visitors should take a tour of Fort Jefferson, which is also included in the ferry fair and which is led by knowledgeable ferry staff. Alternately, you can enjoy a self-guided tour of the fort and its surroundings. The moat boasts a brick walkway, which could be considered the highlight of the park. This is a narrow path surrounded by water that traces the outside of the fort, allowing a glimpse at the impressive fort walls and bastions. Be sure to keep an eye out for the park's resident crocodile while walking the moat! Park staff warns visitors to avoid snorkeling in the moat for that reason. 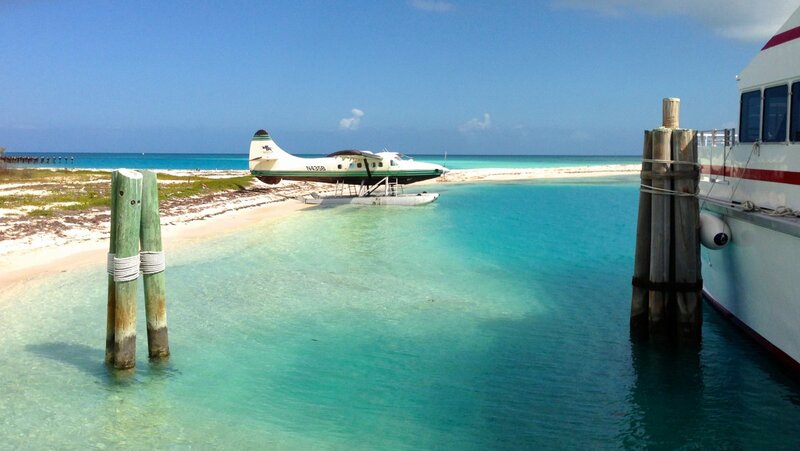 Apparently it arrived after a major hurricane affecting the area 10 years ago and has lived as a castaway ever since. North beach access for snorkeling. Photo by Daniel Sherman. The adjacent Bush Key, and Long Key on its far end, can be accessed by land bridge from Garden Key if the conditions are right. It is permissible to walk along their beaches when these keys aren't closed for bird mating each spring. The park's current bird list includes 299 different types, including the sooty tern, which nests on Bush Key annually. Other wildlife is found beneath the surface, such as sea turtles, nurse sharks, and many different types of fish. It is possible to paddle the waters nearby and even to Loggerhead Key, 3 miles from Garden Key. But there are not any vessels available to rent in the park. The ferry will permit you to bring a kayak along for an additional fee. There is also a shipwreck at the south end of Loggerhead Key. On the other hand, this is a place to relax! You might just want to enjoy sitting on one of the two little beaches or enjoy the shade of a palm tree. There is no better way to truly experience this amazing place than when you have it to yourself. After most of the day use visitors leave with the ferry and sea planes, the few and the adventurous are left behind. Though this does require more advanced planning and a mild amount of gear lugging, you may find this experience one of the most memorable. There are only 10 primitive campsites available on Garden Key, and each accommodates a maximum of six campers. Camping reservations are arranged by the ferry and, as you can imagine, reservations fill up quickly. Each campsite has a table, a tenting area, and freestanding briquette grills (gas canisters are not permitted on the ferry). Be sure to bring enough fresh water for your stay. The sunrises and sunsets are beautiful, of course, and being able to experience them in solitude adds to their beauty. The fort is technically closed at night, but one can still climb to its roof to watch these skies. There is a complete absence of light pollution way out here surrounded by water. On a clear, windless night, these shallow, calm waters can reflect the stars to the point of giving the viewer a surreal feeling of being surrounded by the universe. You may occasionally spot a bioluminescent microorganism glowing on the surface of the water that just adds to the surreal effect. Amenities are extremely limited in the park. The Yankee Freedom ferry serves as a bathroom, a fresh water source, a tour guide service, and a restaurant; it even has equipment rentals and open-air fresh-water showers available while it is docked. All of these amenities are included in the price of a ferry ticket. There is no fresh water source in the park. There are composting toilets available to campers after the ferry has left. A small bookstore is operated by the park service which contains various memorabilia, but no food or drinks are sold here. You might think park staff are roughing it out here, but in fact the opposite is true. An entire wall of the fort has been converted into modern condominiums complete with electricity (both solar and generated) and running water. They use a version of the original rain water cisterns as a water source and have access to internet. So really, they're just chillin' in paradise. Visitors will notice several cannon openings where iron shutters exist. Over the years, this iron has become corroded as a result of the harsh seaside environment. The corrosion is causing the surrounding brick to fall apart, which may eventually compromise the structural integrity of the fort. Costly repairs will be needed in the future to preserve this magnificent piece of history. Cuban refugees regularly make attempts to flee to Dry Tortugas. One boat used for such a landing is on display in the fort. Once refugees set foot on dry American land, they are permitted to seek asylum. Ferry and sea plane, Garden Key. Photo by Daniel Sherman. 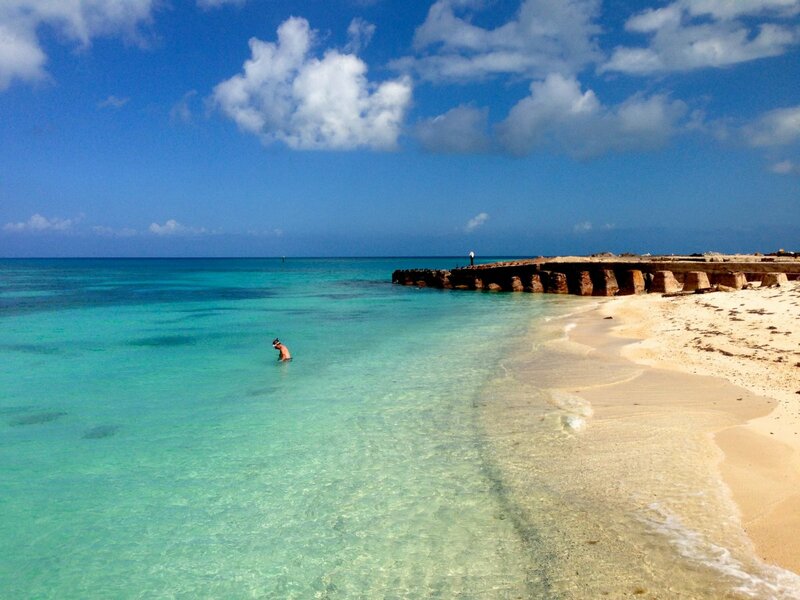 Dry Tortugas lies nearly 70 miles west of Key West in the Gulf of Mexico, and it is only accessible by boat or plane. Most take the park's exclusive ferry, Yankee Freedom II, which sails daily from Key West to Garden Key. There are also sea planes that make daily flights, boats that can be privately chartered, and visitors can even take their own private boats. The park service recently completed construction on five boat slips that require permits for usage and are limited to two hours of consecutive use. There is also a harbor on Garden Key where boats may be moored with a permit issued by the park staff. Whichever method of transportation you select, plan several months in advance of your trip, as they frequently sell out. Winter in the Keys runs approximately from November through April. High winds and rough seas are common; on the other hand, if you happen to hit a calm day in this period, you'll enjoy lighter crowds and cooler weather. The summer season, roughly May through October, is generally calm and warm, with excellent visibility above and below the water. The major exceptions are hurricanes, of course; hurricane season is generally June through November. Visitors are strongly encouraged to check on weather conditions before they depart for Dry Tortugas National Park. Pets are not allowed inside of Fort Jefferson or on any of the neighboring keys. Aside from that, leashed pets are allowed. Owners must remove all waste. Tropical setting. Impressive historic brick fort. Abundant wildlife. Isolated. Isolated. No fresh water source for campers. Expensive to access. A definite must see! So worth the cost. Secluded beaches and tons of marine life. Historic fort and lots of photo opportunities. The true draw of the Dry Tortugas is the GYNORMOUS size of much of the marine life. As a protected area, the fish and invertebrates have had an opportunity to grow to unusual sizes. Definitely bring your snorkel mask. Was there last January and didn't see the crocodile. Will also be back there next weekend. Great camping experience. The stars you can see at night!